Prepare Shrimp: Mix brown sugar, lime juice, lime zest, olive oil, TABASCO® Original Red, salt and paprika in a medium bowl and mix well. Add shrimp and stir to coat evenly. Let marinate 30 minutes to an hour for best flavor. Prepare Chipotle Crema: Place TABASCO® Chipotle Sauce, sour cream and remaining ingredients in a medium bowl; stir until fully mixed and evenly smooth in texture. If an extra spicy kick is desired, simply add a few more dashes of TABASCO® Chipotle Sauce. Set aside and keep cool. Heat grill to medium-high heat. Thread shrimp onto metal skewers evenly, about 5-6 shrimp per skewer. Lightly oil grill to prevent shrimp from sticking to grates. Grill shrimp until just cooked through, about 2 minutes per side until just pink and opaque. Heat the tortillas on the grill until warm, about 5 seconds per side. 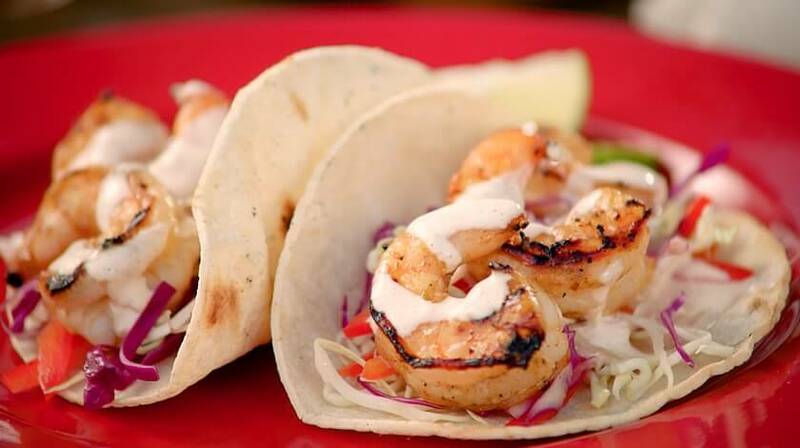 Top each with shrimp, cabbage, peppers and the Chipotle Crema. Serve immediately.